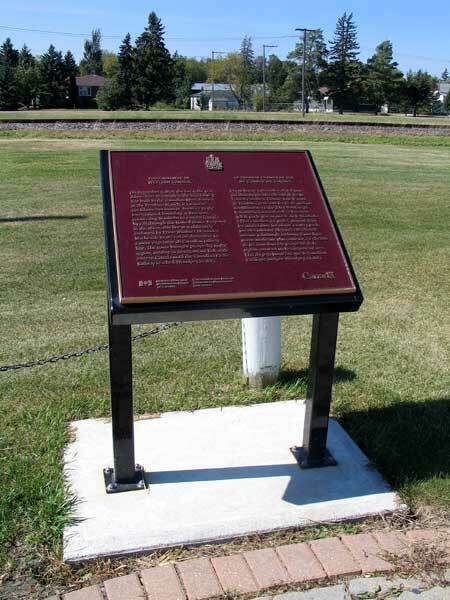 On 3 December 1878, a ceremony was held at this site in Dominion City, in what is now the Municipality of Emerson-Franklin, for the completion of the Pembina Branch of the Canadian Pacific Railway. The ceremony was attended by a large group of people, including William F. Alloway, John F. Bain, Mr. Baldwin, Andrew G. B. Bannatyne, Charles N. Bell, Sedley Blanchard, Frederick T. Bradley, George Brown, Thomas Carney, Mr. Douglass, Arthur F. Eden, Thomas Howard, Mr. Killer, Alexander Logan, William H. Lyon, J. St. L. McGinn, George S. McTavish, Thomas Nixon, James H. Rowan, Thomas Scott, Jacob Smith, George B. Spencer, Mr. Stiles, D. W. Stobart, John Sutherland, James W. Taylor, and Mr. Traill. The Pembina Branch ran some 100 kilometres from St. Boniface to the international boundary at Emerson, connecting Manitoba to eastern Canada by rail through the United States. Proposed in the 1860s, this line was ultimately endorsed by Prime Minister Alexander Mackenzie in 1874 as an alternative to a more expensive all-Canadian railway line. The route brought prosperity to the region, serving as an important link with eastern Canada until the railway reached Winnipeg via an all-Canadian route in 1883. A monument commemorating the Pembina Branch, located beside the Manitoba’s Biggest Sturgeon Monument, was erected in July 2008 by the Historic Sites and Monuments Board of Canada. “Rail communication established,” Manitoba Free Press, 5 December 1878, page 1.